Children are the most creative of us all. With their young minds developing entertaining stories, capture their stories and narrative development with the Story Builder app. Winner of the Best Reading App of 2011 by the Huffington Post, this application assists in story organization, details, and story grammar to guide students to develop the best story they possibly can! 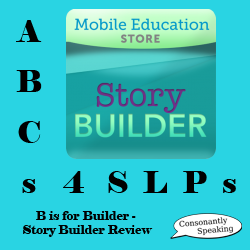 Continue reading for my review of Story Builder! The initial page is shown in portrait format, following a male narrator stating “welcome back to Story Builder”. It shows the last students’ name to use the application as well as various settings you can choose based on a students’ level of cognition, language skills, age, and grade. This Mobile Education Store app has similar tabs at the bottom of the screen to their other applications. There are four different tabs with an icon for each. The Info tab (with an icon of a lower case “i” with a circle around it), brings you to the developers’ information about the application as well as their interpretation of how the application should be used. Mobile Education Tools states that Story Builder is designed to help children accomplish improved paragraph formation, improved integration of ideas, and improved higher-level abstractions by inference. The Settings tab (with an icon of a file cabinet), when pressed, shows you choices for various settings in the application. 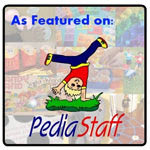 The Play tab (with an icon of a running man), opens the story building activity itself. The Archive tab (with an icon of a floppy disk) shows saved audio files from a students’ previous stories. The Instructions tab (with an icon of a question mark) shows an instructional video of how to use the app. More detail on each of these tabs will follow. When you click on the box that states “New User” or “Not You?”, options will appear to create a “New User” or select an “Existing User’s” profile. If the “New User” option is selected, forms will appear to type the students’ first and last name into. When selected, the keyboard will appear at the bottom to type the students’ name into this box. The students’ name will carry over to the Archives tab on the iPad application. Level 1: Four questions will be asked about each image. Most of these questions will directly relate to something in the image. Level 2: Seven questions will be asked about each image relating to the image or involving inferences about the picture. Level 3: The student is allowed to create their own story about each image without question prompts. This option determines whether or not the text of the question will be displayed on the screen as it is being read. A question pertaining to a narrative aspect is always asked, but if you would rather not have the text on the screen, you can press the “Off” button underneath the “Question Reinforcement” text. If you would like the text to only show when the question is read and disappear afterwards, select the “Intermittent” button underneath the “Question Reinforcement” text. Otherwise, if you would always like the text to be shown, leave the setting with the “On” button. The iPod Touch/iPhone version of the application calls this option “Question Text Reinforcement”. The Color Code Reinforcement option allows the question text background to be highlighted so that the student’s attention is brought to the question asked. This can be great for those who have visual impairments. Select “On” for the text always to be highlighted in a color, “Intermittent” for the text only to be highlighted when the question is read, and “Off” if you do not want the text to be highlighted at all. This option helps students learn how to answer in a narrative form by displaying the first few words in text format of the appropriate response. It can be toggled on and off by pressing the corresponding text button on the “Settings” page. On the iPod Touch/iPhone, this option is called “Answer Introduction Reinforcement” and on the iPad it is listed as in the above heading. If you would like instructions for the “Settings” tab, the iPad provides them for you! When this button is pressed, audio will play describing each of the “Settings” options. Instructions for application play are found under the “Instructions” tab. After selecting your Settings options, press the “Play” tab at the bottom of the screen. A male child’s voice will ask a question about a picture shown. If you have selected for there to be Question Reinforcements, the text of the question asked will display at the top of the screen. If you have selected Color Code Reinforcement to be on, the question text will be highlighted in a color. Finally, if you have selected Story Introduction Reinforcement to be on, the first three words of an appropriate response will appear below the question in large text. Whatever you have turned off in the Settings tab will not display. Following each question being asked, the “Record” button is displayed on the screen in green. This allows the student to record their response to the question being asked. If by chance the student did not hear the question properly, you can click the “Repeat Question” button to allow them to hear the question again. If you do not wish to answer questions about a particular image, click the “Skip Picture” button. After recording a response, more options appear. You can re-record the response by selecting the “Record” button, play the recorded response by selecting the “Play Answer” button, select the “Repeat Question” to hear the question again, or if everything is the way you want, select the “Next Question” button. Selecting the “Next Question” button will play a new question about the same picture. If you are playing Level 1, there will only be 4 questions. Level 2 will ask seven questions. Following the completion of all of the questions, depending on which level you chose, you are able to select the “Play Story” button. This will play each of the audio recordings the student made in response to the questions in order. When played back, it will sound similar to a short story with all of the appropriate details about the picture. Level 3 game-play is quite different than the first two levels. There are no questions asked in this mode. When beginning play, an image will appear and the narrator will state, “Make a story about the picture. Make sure to use complete sentences.” If you wish to select a different picture, click the “Skip Picture” button to view a new picture. To hear the narrator’s directions again, press the “Repeat Question” button. Once the directions are heard, the student can then record their story by pressing the “Record” button. When the student is done with his or her story, press the “Stop” button to stop recording. After the story’s recording is complete, you can play the entire story’s audio by selecting the “Play Story” button. You have the ability to pause the story at any point to discuss a part of the story with the student by pressing the “Pause Story” button and resume it by pressing “Resume Story”. After you listen to the story, you can click the “Next Picture” button to move on to another story. If you wish to save the story to the Archive, press the “Save Story” button. A popup window will appear where you can enter the students’ name into the box to save it. Then, after typing the students’ name, click “Save”. When you listen back to a story, if the questions are answered appropriately, the story flows together as well as it can. However, if the questions are answered inaccurately or if the student states “I don’t know” as an answer to any question, this can make the story sound broken up. If the story is not completed in the way that it should be, it is good to discuss which part of the story sounded odd with the student and why. Any story that you have previously saved for a user will appear in the Archive tab of the application. When you are in a specific students’ profile, the stories saved for that student will appear in the Archive tab. To hear a previous story, select the story you wish to hear by clicking on an image/name underneath “All Stories”. Once you click on a story button, you will see the large image associated with the story on the left hand side of the screen. This way, you will be able to know if that is the story you want to listen to. Click the “Play Saved Story” button to hear the entire story from beginning to end. You cannot pause the story once it is played. If you want to delete the story from the archive, select “Delete Story” underneath the photo or swipe your finger to the left over the story’s button and press the red “Delete” button. You can delete all stories for a user by selecting the “Delete All Stories” button. The application will prompt you asking if you are sure you want to delete a story, just in case you pressed the “Delete Story” button by accident. Click “Yes” to delete it or “Cancel” to keep it. You can e-mail the selected story by clicking the “Share Story” button. When you press the “Share Story” button, the Mail application will pop up. You can enter who you wish to send the file to and it will be attached as a Quicktime file. Once you have completed all of the information needed to send the file over e-mail, click “Send”. If you selected “Share Story” by accident or change your mind about e-mailing it, you can click the gray “Cancel” button to return to the Story Builder application. Select whether you would like to save the e-mail as a draft to work on later or to delete the draft. E-mailing a story on the iPod Touch/iPhone version of the application is different because there is no option to save a story to an Archive. Therefore, in order to send the audio file via e-mail, you must send the story you just recorded while still in Play mode. You have the option to e-mail the story once all questions have been asked and answered, and you have pressed “Play Story”. Select the “Email Story” button prior to clicking the “Next Picture” button or navigating anywhere else on the iPod. The e-mail form will pop up just like in the iPad version with the same options. Like the iPad version, it will be sent as a Quicktime file. When the “Instructions” tab is selected, a narrator and video explain how to use the application within the app itself. This is different than the Conversation Builder application where the user is directed to a YouTube video by the app developer. You can click “Stop Instructions” at any time to stop the audio of the instructions; however, when you press “Play Instructions” again, the audio and video will start from the beginning. Some of the instructions are great for students to listen to so that they can understand what is expected of them. This application is great for teaching students all of the story grammar and details that are necessary for a story. In Level 1, it does not allow the student to leave any details out. Level 2 allows students to make inferences. Level 3 leaves students on their own to state as many details in an organized sequential manner that they can. This allows the student to be as creative as he or she wants to be as well. 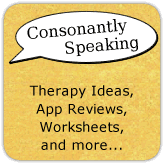 Level 3 is excellent for language and narrative samples for IEPs. In addition, one can record and listen to the progress made from the beginning of the year to the end of the year in regards to sentence structure, sentence length, descriptions, details, story grammar, and story organization. This is great to have the parents of the student listen to at their students’ IEP. The narrator’s prompt to make a story about the picture with complete sentences really helps my students mentally prepare their story in their minds. I would love it in the instructions video if when you pause the video, it could start where you left off instead of at the beginning. Sentence Expansion – If a student states a short response to a question asked, ask the student to add more information. Discuss the question and how to add additional information. This may include details from the background of the image, actions of the peer(s) in the image, and emotions of the peer. Add action words, adjectives, and prepositions to sentences. Problem Solving/Social Situation – If the image shows a person who is upset or angry, or shows a problem, ask the student how they would handle the situation if it happened to them. Ask them how they would feel if they were in the same situation. Writing – Have the student write his or her responses to the questions or write a story about the picture instead of recording his or her responses. WH Questions – Many of the questions asked by the application are wh questions (who, what, where, when, why). Have students work on their answers to wh questions and indicate what each type of question means. Discuss what type of response matches with each question (a person, location, because statement, object, spatial position, or time). Memory – Show the student the picture. Then, turn the iPod/iPad’s screen off. Have the student state or write as much as he or she can remember about the picture. Turn the iPhone/iPad’s screen back on to compare notes. The Story Builder application is available for the iPod Touch and iPhone for $5.99. It is also available for the iPad for $7.99.